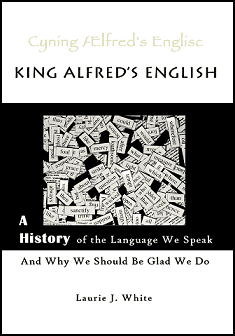 King Alfred’s English: A History of the Language We Speak and Why We Should Be Glad We Do is a homeschooling mom’s dream. It includes European and Bible history, etymology, literature and geography – all in one captivating book! Not only does this excellent read neatly incorporate several subjects in one readable volume, it’s clear and funny! I absolutely loved King Alfred’s English. And I bet you will, too~ and so will your late middle school and high school students. This history of the English language answers several of my questions, such as: Why are Spanish, Italian, French, etc., called Romance languages? (Answer: Because they were all derived from Latin. Rome = Romance). A former homeschooling mom herself, the author organizes her book around four major periods of change in the English language that she calls “language invasions.” These are major shifts in English caused by the changing political or cultural climates during the history of Britain. I mean England. These ‘invasions’ added hundreds of words to our language. How Does English Stack Up? How does the English language match others in sheer number of words? The author compared a few other countries’ dictionaries for a clue. English dictionary – a whopping 615,000 words! As she defines the shifts and changes in English, the author describes the historical and cultural changes, as well, and brings us along for the ride. The sometimes complicated history of Europe overall and England, particularly, becomes so much clearer reading this book. As well, her chapters on the Reformation are enlightening. They help us more clearly understand its impact on the European culture of the time and the generations around the world that followed. Mrs. White also introduces a topic that was new to me. She describes how William Tyndale, through his English translation of the Bible, both promoted the Reformation cause and influenced our language. Some of his choices of words and phrases have now seeped into the fabric of our culture. Familiar phrasings such as “eat, drink and be merry,” “fight the good fight,” and “the salt of the earth” are among Tyndale’s memorable contributions to our literary heritage. In summary, don’t miss King Alfred’s English . Children from late elementary on up will enjoy listening to this as a family read-aloud, and it can be assigned as an independent reader from late middle school on up to your high school student studying British history or literature. And I promise – you will learn and enjoy it as much as they do! This C. S. Lewis quote definitely applies to King Arthur’s English. Have you read it yet? What did you learn that surprised you? In the interests of full-disclosure, I received a copy of this book from the author for review purposes, although the opinions given in the review are totally my own. My children often quiz me about why English is so stupid -kn, gh, gn, silent b’s etc. My answers aren’t always helpful so maybe I need this book. This looks good! I look forward to reading it. This sounds like a neat read. I love the language arts half of education so much and would love to use this as an interest-promoting book for my kiddos. They love facts and trivia like some you mentioned! I have always been fascinated with languages and word origins. It sounds like a worthwhile read! This looks good! I look forward to reading it. Thanks for the summary. Glad you enjoyed the post! King Alfred’s English is the perfect example of a living book. 🙂 You will definitely enjoy it as much as your daughter. You’re welcome (re: posting in the CM carnival. I hope to submit another post soon. Love this post! I will definitely get this book, and I know my daughter will love reading it….but she will have to wrestle it out of my hands first. I agree! Thanks for stopping by, Bonnie! Got here through the CM Carnival. Thanks for the recommendation. I teach high school students and this is a wonderful book!